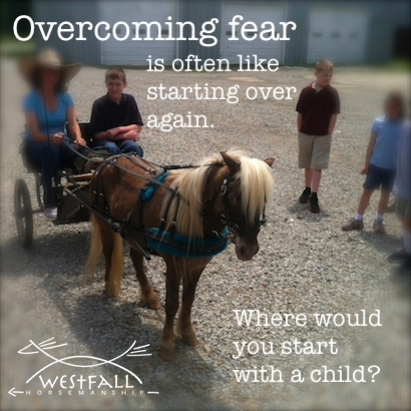 After an accident with a horse how can I get over my fear? How can I make the process easier? “Hi Stacy, I am in Australia and I have watched your videos and read some of your posts. I have also heard a lot about you from friends. I was wondering if you have any advice for a horse lover who is terrified of horses. When I was 12 I had an accident and fractured my skull and was in a coma. I was not permitted to get back on for a year. My mum was riding with me and broke her leg saving me. She was in hospital longer than me. We never rode for a long time, which is probably part of the problem. Mum rides sometimes now and is more confident than me. I have had some lessons but circumstances create big gaps between lessons. This means I start over all the time. I can’t remember the accident. I can now be near them it shake and feel sick when I lead them or ride them. How can I make this process easier?”-Kate A. Then I read your question again and saw that even leading them causes you stress. I was reminded of how my boys, in a matter of days, dramatically increased in confidence after we got our mini’s. The interesting part was that the horses they had always handled were trained better than the minis…but the minis were small, less intimidating and made us laugh. There are many ways that you could work through this. The biggest red-flag that I see in your question is that you have had circumstances that create big gaps between lessons. It isn’t ‘wrong’ but as you have already identified the lack of consistency will cause you to repeat more than if you were able to be consistent. I wrote a blog titled, “After an accident I have lost my confidence, what do you suggest?” that discusses a similar topic from a slightly different angle; you are interested in getting confidence around any horse and she was interested in confidence around her specific horse. It is still worth reading as the answer is still what I would recommend to you. “Your confidence can be and – in my opinion – should be regained! It would be a tragedy if you allowed an adverse incident like this to set a pattern for you of avoiding anything that has scared or hurt you. I know what you’re going through, ’cause after the accident (my bicycle vs. pickup truck – bike loses, bigtime!) There’s nothing like lying in bed with the “tape” of the accident playing over and over in your head to scare the willies out of you….) I did three months in hospital and over a year in a rehab center! I was lucky; I had been a horse person since I was little and KNEW that when you fall off you get right back on before you get scared and lose something you love. Neither you nor I had that option, but I was riding a bike (nervously!) as soon as they put a knee joint in my cast; my horse (with stirrup removed on the cast side) as soon as I could swing my leg over his back. I have also had a bad wreck and been absolutely terrified to ride for about five years after. I could not get past my fear even though I tried all sorts of horses and situations. I could not even tack up a horse for someone else to ride without physical symptoms which the horse then picks up on. In absolute desperation, I turned to hypnosis. It was a life-saver. Trail riding was my goal. The gentleman would tape the sessions so I could replay them at home. I would attend a session and then go directly to a riding lesson. I started off slow and took a few lessons, made a list of areas I needed to improve on and go back for more hypnosis. I went two more times that summer while I continued lessons. At the end of the summer, I started looking for my trail horse. That was more than five years ago. I now own a fabulous horse, and spend many confident hours and miles in the saddle with absolutely no fear. Kate, I have been riding all of my life and have had some wrecks over the years but one of them had horrible consequences and caused me to loose my confidence and have fear that I just could not control. The effects of that of course transfered to my horses and on our rides there was always that hanging over us. Last year I discovered EFT or tapping. It has made such a positive change in my life including my riding that I just have to tell you about it. If something can happen in a split second that can change you forever why can’t it be changed back in a few minutes? Tapping is so simple and so fast with such huge results it is worth a try. You can find you tube videos on tapping as well as the website http://www.thetappingsolution.com Nick Ortner wrote the book the Tapping Solution which I highly recommend. I was afraid that I wouldn’t dig deep enough on my own so I did one session with a practitioner over the phone and it has changed my life. Yes, the comment about seeking professional help is right on the money! I have had ongoing anxiety after my husband suffered a head injury and broken hip from a horse accident. 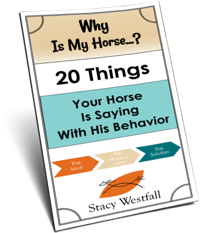 Last year my riding coach referred me to an online course written and facilitated by an equestrian woman sports psychologist to help me with my fears. It is called Riding Out of Your Mind by April Clay. It is open to ALL riders of all disciplines and experience levels. It had a FaceBook closed group which was supportive and extremely helpful, plus you also get a one one one consult with her, too. Also the price was only $125 Can for 6 weeks. It helped me immensely. Best investment I ever made! Good luck…it is SO worth it!!! I was seriously injured 14 years ago by horses – so badly that I was in Shock Trauma and if not for the amazing docs and nurses there, I wouldn’t have made it. I sold my horse and left riding completely. I couldn’t even hang with my “horsey” friends. (I missed them terribly but I had to cut all ties with everything related to horses) I have been riding since I was a kid and now I found I couldn’t even watch a Western on TV. It wasn’t just the loss of horses but the loss of a lifestyle. Finally, I decided to volunteer at a Riding Therapy program. Before I could do that, I had to step into a barn! I remember literally shaking when I walked into a barn for the first time. I was hyperventilating and so very scared. PTSD to the max! The horses were old and easy going, they were therapy horses, safe for challenged kids and I was still worried. But I made myself stay in that barn for a while. Smelling the scent of manure and fresh hay and horses. I felt like I was coming home. That being said, I was still terrified. It took me a long, long time. Desensitizing myself little by little. Acceptance by the horses themselves is what helped me. They didn’t care if I was scared, or stressed, they didn’t care if I was unsure or even crying. When I finally wrapped my arms around a furry neck and breathed in, there was nothing but quiet breathing and my own trembling. It took a very very long while to go from that to mucking stalls. Then to turning in and turning out. Eventually, I rode again and now I have my own horse for the first time in 14 years. For me, it was a long, long rode. I pushed myself but only at my pace. I had a goal, helping kids and the horses who gave them hope. I didn’t just get back in the saddle. (Then again, I could barely walk!) When I first rode, I made sure the horse was kind and a confidence builder. I am still a work in progress as a rider. I don’t have the stamina I once had and I am significantly older. My muscle memory wants to do more, but I am still afraid although my new horse doesn’t buck or carry on. I walk and trot and practice halts. My advice it to do it when you are ready. Take your time. Go at your own pace. When you feel it is too much, back off and go back to just walking through the barn. Make sure the horses you decide to start back with are kind and slow and patient. Most horses are not going to really hurt you, but some are so forgiving and giving – those are the horses you should seek out. Just remember, little tiny steps. It can take weeks or months or years. There is no time frame. I wish you all the positive energy in the world and the confidence to take that first step. thank you very much for this, I am reading this at a time where I have decided to get back on a horse after a riding accident 6 years ago. I did ride about 18 months after the accident and then it got too hard for me. Too hard in that the fear started overtaking me, this included like Kate’s post fear on the ground with horses and when my daughters ride I can feel the fear all over again. I’ve been following your blog for about a year now and it has been such an inspiration to me as I make my way back to horses after nearly 20 years “off.” Thank you!! I can totally relate to Kate A’s feelings of fear and frustration. I began riding regularly again in April of 2014. I been in a lesson program since age 12 (I’m almost 32 now). As a kid I was sooooooo horse crazy, but then I had an accident on my TB mare and at the same time experienced serious family trauma. It was all too much at once and I gave up. I barely remember my experience in general from that time. I don’t even remember what my horse looked like really. Years went by and I would try to ride again but I usually got way too emotional to enjoy myself. I also started to feel scared around the horses. Last spring I decided I would find a trainer with solid beginner horses and start from the ground up. I also went to therapy for 2 years to work thru the family trauma. I learned to look at the past more objectively and see how it had influenced my decisions. I learned that giving up horses was collateral damage but that the damage didn’t have to last forever. I did not have to surrender my joy anymore. I asked my trainer to treat me like a brand new student with no horse experience. This allowed me to let go of expectations. I spent a LOT of time watching and grooming the horses and helping around the barn which helped me feel comfortable from the ground. I watched the Jac series twice 🙂 I asked to be lunged at the trot before going out to the rail on my own. The first time I trot around the ring I started to cry because I felt so much like myself. And then the canter nearly blew my socks off I was so overjoyed. My trainer was awesome. So patient and kind. Since then I’ve ridden twice/week on two different horses and I’m advancing past where I was as a kid 🙂 plus, best part, I have so much fun. There is definitely something to working thru traumatic memories/experiences with a professional. There is equal value in finding a supportive trainer who understands horses AND people. I hope you will give it a shot and allow yourself the time to rediscover this piece of yourself. Big hugs. Great advice from Stacy and everyone else! I would like to add, invest in the book “Riding Fear Free” by Laura Daley and Jennifer Becton. You will not regret it! It has helped me immensely after several traumatic riding accidents, and offers a unique and effective approach to recovering from fear. You can also join the online support group-great people!! Check out the Facebook site Riding Fear Free. I battled with my fears and tried everything out there, but nothing worked until I found this book, and now I can happily report that I am progressing toward the confident and competent rider that I was before those terrible accidents. Hope this helps! I wish you the best and hope you find your way back to enjoying horses. The quote you put on this post on the photo is spot on perfect. And it applies to more than just horses, as is always true with all of your posts. Your thoughtful posts and videos always either teach me something, reaffirm thoughts, or help improve some aspect of my day, life and work; and I am sure I speak for most reading this blog as well. Thanks for all the work you do–both in training and on this blog. The sheer variety and relevance to life and a ‘deeper truth’, of each and every post is extraordinary. You make this world a better, healthier place, one training session at a time and one blog post at a time. I agree with Janette. You need to address your post traumatic stress with professional help, and then if you’re serious about getting back into horses, immerse yourself in a lesson program where there are trained horses and coaches to help you through. The symptoms of anxiety can be easily mistaken for fear. I’m not a trained psychiatrist, but it sounds like Kate is suffering Post Traumatic Stress Syndrome. In addition to all of Stacy’s advice and as Annie suggested, professional psychological support will help Kate enjoy horses again. Good on you Kate for asking for help, your on the right track to recovery. 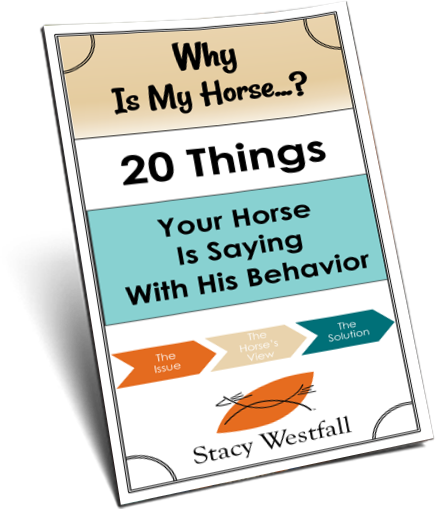 I so relate to your experience on a much smaller level with the horses – but still relate! I agree to start small and also, don’t do it alone. Find a friend or trainer who has gone through what you’re going through and gotten to the other side to be with you as you regain your confidence and to remind you it can be done. I’ve had to go through the same thing after a fall that broke my back/sacrum, but on an even bigger level I had to go through the same thing riding in cars, after I was hit by a drunk driver and it broke my neck and put my friend in a coma. In both situations having support from folks who understood and could push me just enough to keep going (but not so much I was overwhelmed) was really key to my being able to overcome my fears. You can do it and you sound very brave to me! I’ve seen a couple people just give up after an accident and refuse to try to be around horses anymore despite how much they love them and it’s heartbreaking because I know it doesn’t have to be that way. How I got over it was to sell the reactive, under trained, too strong horse I had, for a beautifully trained mare, with lots of brains, and non reactive. Took myself to a good trainer to learn how to ride her properly. So now at 64 I compete in Western performance, headed towards reining, and I’m not scared in the least. She is and continues to be my confidence builder.